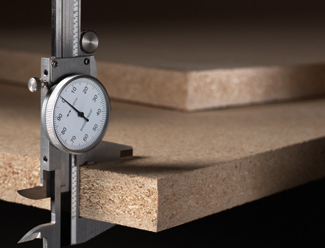 Metro Hardwoods stocks MR10 (moisture resistant) Premium Industrial Particleboard with added protection against occasional wetting and high humidity. Often required in commercial applications and great for added protection near sink applications in residential construction. Industrial particleboard is an engineered composite panel wood product species of wood particles formed and bonded with an interior resin and meets ANSI MR10 standard. ANSI MR10 specification for premium countertop grades with a thickness swell value of 5.5% or less (ASTM D 1037 24-hourwater submersion).